SSA - does it prove congruent triangles? AAA and AA - do they prove congruent triangles? ASA and AAS - do they prove triangle congruence? 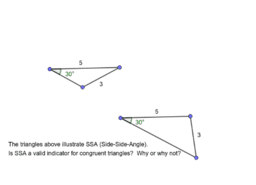 SAS - is it a valid tool for determining triangle congruence? SSS - Does it prove triangles congruent? HL - Is it a valid way to prove right triangles congruent?